Lately, the "Brazilian Blowout" — a relaxing treatment that results in lustrous locks — has been under the gun for its use of formaldehyde in amounts well above what the FDA condones. 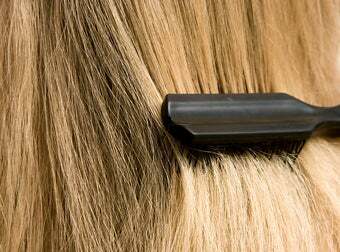 Brazilian Blowout has always claimed that unlike other straightening treatments, it left hair healthier. The rest of the body? Maybe not so much. A recent Oregon Health and Science University test found that the Brazilian Blowout solutions — even those that label its bottles "Formaldehyde free" — contain potentially carcinogenic Formaldehyde in amounts well above the 0.1% which the FDA recommends, and even the 0.2% which the Cosmetic Ingredient Review panel condones. And given that the solution is hot-ironed into hair, this is no joke — especially for the technicians breathing the stuff in day-in, day-out. The test results coupled with health symptoms reported to us from stylists using the specified hair product raised concerns at CROET because of the potential long-term and short-term impacts of formaldehyde exposure. According to the Centers for Disease Control, formaldehyde can produce a variety of effects including immediate irritation of eyes, skin, nose and upper respiratory tract, cough, chest pain, shortness of breath and wheezing. The major concerns of repeated formaldehyde exposure are sensitization, which is similar to an allergic condition, and asthma in those who have been previously sensitized to formaldehyde. Additionally, the Department of Health and Human Services has determined that formaldehyde may reasonably be anticipated to be a carcinogen. Why am I so pissed off about this? Because countless women are having this treatment done instead of others, erroneously believing it's perfectly safe. Countless stylists are performing this treatment instead of others, erroneously believing it's perfectly safe. We're big boys and girls and we deserve to make adult choices for ourselves, but particularly when it comes to our health, we have a right to crucial information–and to be denied that crucial information and unknowingly exposing ourselves to high levels of carcinogens for a company's financial bottom line is despicable. We agree: and think a little frizz is well worth the price of your stylist's health — not to mention your own.